The EcoAlign web site was designed by studio:module with a limited budget to position a new DC-based marketing firm as an upstart in an industry dominated by giants. As such, the site was designed to break a number of rules for web design and make a strong first impression for the new agency. From a design point of view, it showcases the how far Drupal’s Zen theme can be pushed for a fresh, innovative look and feel. The three column grid was swapped with the main column being on the right. The layout combines photo collage with hand-drawn line work for an airy overall feel. 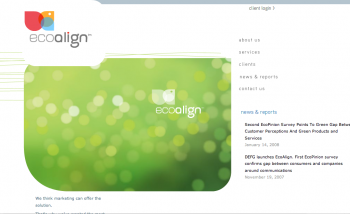 EcoAlign is a strategic marketing agency focused on the energy and environment space. Its mission is to align consumer behavior with energy and environmental needs for products, services and programs. Ecoalign evaluates, creates and executes alignment through a set of unique research techniques, insightful strategy and innovative communication approaches. Only two months out of the gate, Ecoalign is competing with the likes of Ogilvy and JWT for large-scale advertising and marketing projects in the energy industry. The company’s research is being downloaded and cited by other analysts and the business media. The web site is positive proof of the power that good design, solid messaging, and the Internet can have on an emerging company.